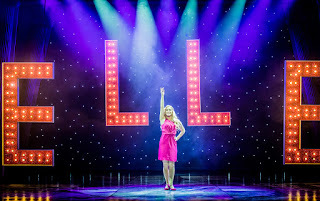 The first few minutes of Legally Blonde were a sea of pink, shrieking and giggling, both on and off the stage, with the audience sipping pink cocktails through pink straws while the cast introduced UCLA student and sorority president Elle Woods. When the cerise-tinted star's boyfriend unexpectedly ends their relationship (citing her lack of seriousness) rather than producing the expected ring, Elle reacts by following him to make an unconventional and pom-pom waving application to study law alongside him at Harvard and adapts with difficulty to the new competitive environment. I'm told by the aficionados sitting around me in the Grand Opera House that the musical's plot closely follows the storyline of the film, based on a novel by Amanda Brown. At one level it's a show about building confidence, overcoming prejudice, the power of friendship, setting and achieving goals, as well as a nod to the cuteness of dogs and a reminder that everyone needs a good hairdresser! At another it's a strange hodgepodge celebration of women's self-objectification queasily balanced by a well-packaged open-shirted delivery man, with a pivotal moment of male sexual powerplay that should in 2018 have provoked Elle to shout "Me Too!" 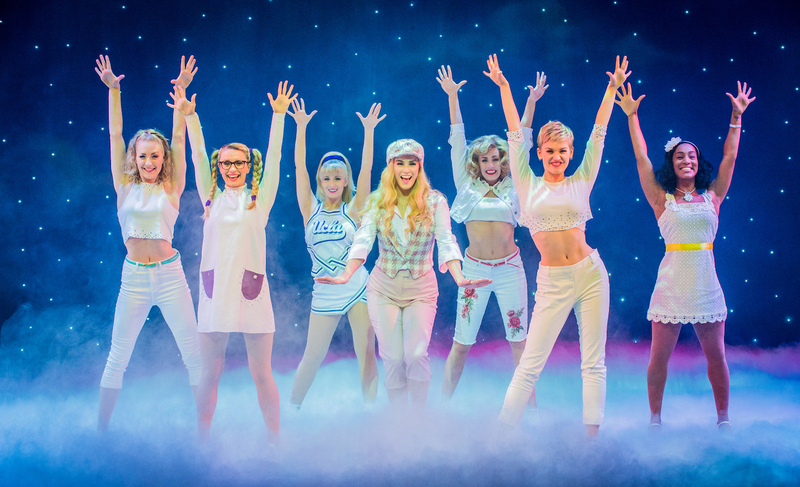 While the premise is flimsy and the entertainment is untaxing, there's a sophistication to this touring production which cleverly uses whitened versions of already familiar costumes to form a six person Greek chorus who pop out to challenge Elle when she needs to alter course. The folk up in the fly tower are kept busy dropping the set into place, and the transformation from courtroom to accused's bathroom is visually funny and speedy. And who realised that you could simultaneously sing, dance and synchronised skip in the dark with neon ropes? 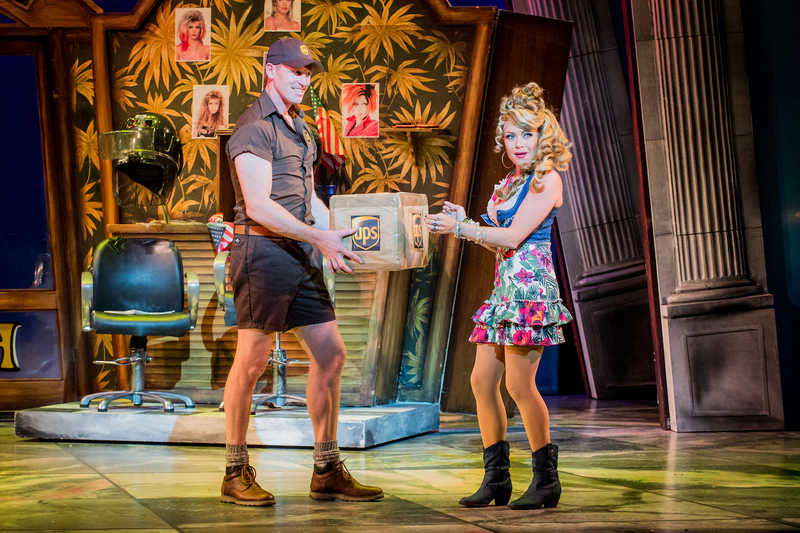 Legally Blonde can now take over the mantle from Lally the Scut for bringing the largest tricolour to an Northern Ireland stage. The rendition of Ireland and the subsequent parody of Riverdance works particularly well with the local audience and disguises some weaker songs which change key every stanza and are nearly impossible to hum. There! Right There! was another audience favourite with its un-PC refrain "gay or European" as a witness's credibility was questioned by the crack team of Harvard students. Lucie Jones skilfully takes Elle's character on a journey of assimilation and gravitas-building before emerging from her boring navy legal chrysalis to embrace her inner sparkling pink self once more to demonstrate her legal prowess. The former UK representative at Eurovision is an able singer and dancer, enhanced by the strong ensemble voices and impressive vocal gymnastics by Laura Harrison (who plays Vivienne). If you love the film, you'll not need rose-tinted spectacles to enjoy this live musical recreation of Legally Blonde which plays in the Grand Opera House until Saturday 3 March before continuing it's UK tour.